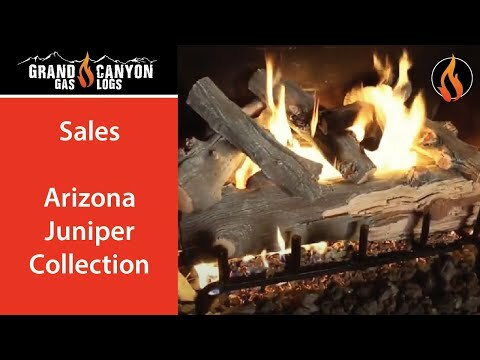 The Arizona Juniper collection is cast from real juniper logs found in the pine forests of Northern Arizona, capturing the distinct pitting and twisting in a unique hand-painted gas log set unmatched in realism and detail. Every log in the Arizona Juniper collection was handpicked, and each size in the collection has its own unique logs. The Grand Canyon 2 Burner system mirrors a real wood burning fireplace, is ANSI and CSA certified and is tested to withstand and produce heat. This burner also allows for gas to connect on either side, depending on where your gas inlet is located. Get great ember bed coverage and superb flame height with this American-made 18-inch natural gas log set that has a main burner in the back and a second burner in the front that also acts as an ember burner. The attention to detail and flame presentation is what allows Grand Canyon to produce realistic displays that fill any room with warmth and comfort. Set includes: logs, burner, flex line, damper clamp, gas inlet fitting, lava rock, and embers. Burner Output: 52,000 BTUs. Burner Ignition Method: match light using your existing wall key valve. This set gives your fireplace a unique look that differs from traditional oak logs. The Arizona Juniper logs are individually cast and hand painted to bring out the realistic details of the natural wood that include twisting, pitting and cracking. The ceramic refractory logs are made with steel fiber mesh for durability and is covered by a lifetime warranty. The dual front burner is designed to produce the most realistic flame and is built to last with a stainless steel pan and schedule 40 black pipe grate. This log set is also available with the Kiva burner, which is designed to fit Adobelite Kiva fireplaces. 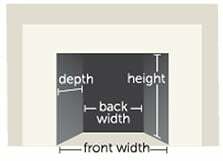 The Tee-Pee burner allows for high flame visibility in a shallow depth. Grand Canyon burners and logs are 100% American made.